Many a loose leaf tea drinker will admit to having a cupboard full of strainers, tea pots and various mugs that assist them in consuming tea. In China, that cupboard would be full of gaiwans. This simple lidded bowl lends itself to truly appreciating the tea in many ways that a teapot just cannot accomplish. 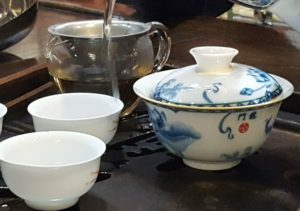 A gaiwan can be used to drink just about any tea you would like. However, traditionally it is reserved for white, green and lighter oolong teas. There are some teas we would not dream of drinking in anything other than a gaiwan, like Bai Hao Silver Needle. This is due to how the gaiwan amplifies smell and mouthfeel when following the traditional Chinese method of using a gaiwan. The first step of using a gaiwan is to warm it with hot water and to discard that water. This seems like a silly step. However, it gives you an opportunity to smell the dry leaves even better. If you put the tea in just after this, the warm ceramic allows the smell of the dry leaves to become stronger. It is expected in China that the drinker will take the time to bring the gaiwan to just under their nose to inhale this fragrance before adding water to the leave. This allows the drinker to better appreciate what they are about to consume. While drinking the tea, it is expected that the drinker will stop before putting the tea in their mouth and smell the brew. The bowl shape of the gaiwan makes it easy to smell before drinking. There should be no expectation that the dry leaf and the brew will smell the same. Often they do, but in some cases they absolutely do not. There is a green tea in China called Mo Li Xiang, where the dry leaves smell like duck/chicken poop but the brewed tea has a sweet dry grass aroma. So to appreciate tea the Chinese way, stop and smell both the tea leaves and the tea before you drink. These simple steps lead to a better appreciation of your tea. Fascinated by the gaiwan, read about how to use it and its history in this blog post. This entry was posted in Tea History, Tea Preparation. Bookmark the permalink.